Two Royal Canadian Legion poppy donation boxes meant to collect money for veterans have been stolen in Coquitlam, B.C. Someone cut a wire and stole a donation box from a Tim Hortons on Friday night. A second theft was reported on Tuesday after a box went missing from a library. It’s unclear how much money was stolen but every dollar taken means one dollar less to support programs for veterans. Laurie Chapman of the local legion branch said that volunteers will be stepping up the frequency of checking on the boxes between now and Remembrance Day. Cpl. Michael McLaughlin said police are going through surveillance camera footage in an attempt to identify a suspect. He suggested business try to keep the boxes behind a counter. “This is something we take seriously and, like everybody, we want to make sure that we get to the bottom of this," McLaughlin said. It wasn’t not the first time thieves have taken the legion’s poppy boxes. Sixteen donation boxes went missing in Sudbury, Ont., last November. Donations meant for the legion have also been stolen in recent years from Halifax, Nanaimo, B.C., and London, Ont. Chapman suggested that stealing from the legion is especially shameful. “We wouldn't have our freedoms today if it wasn't for our veterans,” she said. 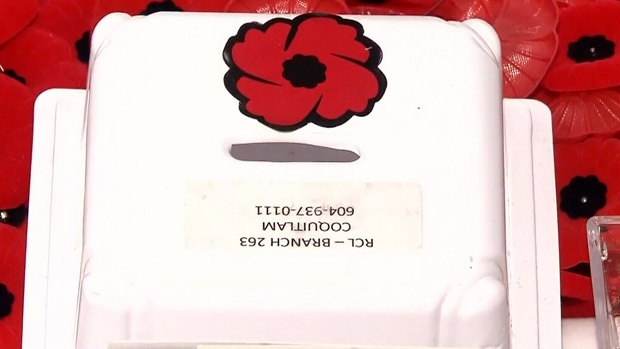 Royal Canadian Legion poppy boxes have been stolen from a Tim Hortons and a library in Coquitlam, B.C.